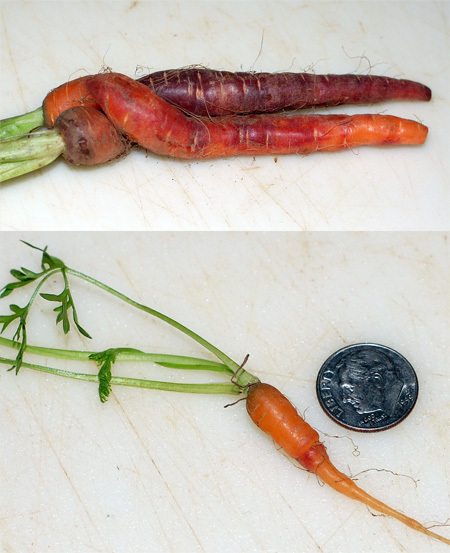 I’ve been fascinated by photographs of purple carrots before, along with red and yellow and white varieties, but until last weekend, I had never seen them in person. They were buried amid bunches of your standard orange carrots and looked a little shabby, but I wasn’t about to pass up that opportunity, even though they threw off my strict farmer’s market budget for the day. Did you know that the orange carrots we all expect these days were not cultivated until as the Dutch Revolt as symbols of the House of Orange? The earliest iterations of wild carrots were almost certainly purple and yellow. We all know carrots are good for your eyes, thanks to their hefty doses of beta-carotene. 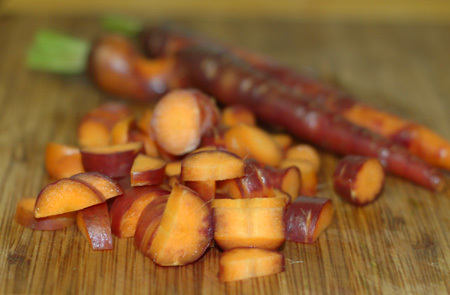 Purple and red carrots have even higher concentrations of beta-carotene, along with anthocyanin, a phytonutrient loaded with antioxidants that I’ve mentioned before. 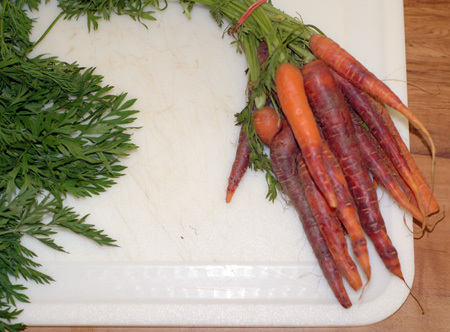 As with many vegetables, the smaller and fresher your carrots are, the more naturally sweet they will taste. You’ll know they were harvested recently if they come with their leafy tops still attached, but cut the tops off before storing, or you’ll end up with floppy carrots whose stored sugars and moisture content have been siphoned off as life support for the greens. I won’t weigh in on the ongoing argument about whether carrot greens are phenomenally good for you or potentially toxic: I’ve added the tops of organic carrots to stock a few times and survived, but I’ve got enough confirmed non-toxic greens in the house that I can toss the carrot tops without feeling guilty. As it is, I still have radish greens and arugula to sort out, and you saw that pile of turnip greens from a few weeks back. I used some of my purple carrots to make a quinoa pilaf stuffed with a medley of local vegetables. Between the sweetness of the carrot, mild bitterness of the turnip, peppery arugula, crunchy pecans, and succulent tidbits of chicken, every bite of this pilaf comes together in a slightly different way; but this is a kitchen-sink recipe, so throw in whatever you have on hand. It also makes for a very democratic meal, being gluten-free, dairy-free, and easily turned vegan or fully carnivorous by swapping in vegetable broth for the chicken stock or serving it as a bed for a main course like chicken or fish. My ingredients were flavorful enough on their own that I didn’t want to muddy the waters with extra seasoning, but if you are making this dish to clean out the crisper of tired veggies, you may want to add a handful of freshly chopped herbs or some complementary spices for some oomph. This would take well to an Asian slant, adding a splash of soy to the quinoa’s liquid, a scrambled egg and drizzle of sesame oil to the finished pilaf, and maybe even some toasted nori in place of the kale chips. My organic quinoa needs to be rinsed before cooking to remove their natural coating of bitter saponins, of which I am reminded every time I open the bag and take a whiff. I use a sieve to rinse my quinoa under running water for a minute or two, until the bitter smell is gone. If you don’t have a sieve with small enough holes, you can line a colander with several layers of cheesecloth or sturdy paper towel (maybe even a coffee filter). In a large pot, saute onion and garlic in a few tablespoons of olive oil until tender. Rinse quinoa well and add to the onions; stir to coat with oil and toast until you hear some of the grains starting to pop. Add the chicken stock, bring to a boil, reduce heat and simmer, covered, until liquid is absorbed and quinoa is cooked and fluffy, about 15 minutes. 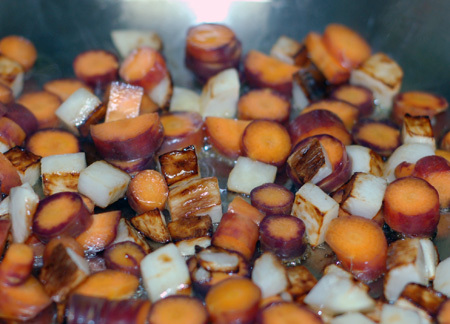 Meanwhile, saute turnip in olive oil until lightly browned; add carrots, lower heat slightly, and continue to saute until carrots and turnip are tender but not mushy. Season with a pinch of salt, and add to cooked quinoa with chicken and pecans. Splash a bit more olive oil in the skillet and saute the zucchini shreds with a pinch of salt until tender; add to the cooked quinoa. 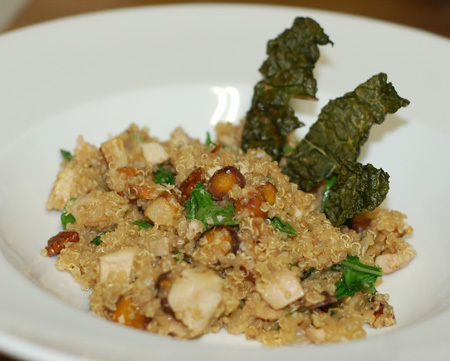 Finally, stir the arugula through the quinoa, toss it all together well, and serve garnished with kale chips. 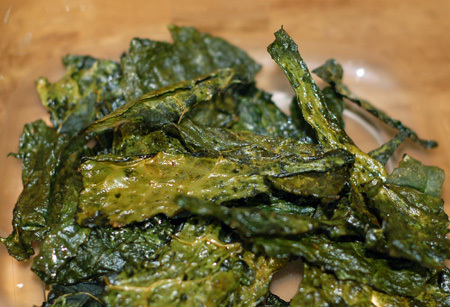 These shatteringly crisp baked kale chips remind me of nothing so much as toasted nori in appearance, but their flavors speak of earth, rather than ocean. Preheat the oven to 250F. Remove the stems and woody ribbing from the kale, more so than you would do in other applications, as the ribbing can get flossy as it dries. Tear the kale into bite-size pieces; wash and dry. Add 1–2 tablespoons of olive oil to a large bowl. Whisk in any desired spices, then add the kale leaves to the oil and toss with your hands, coating each leaf, front and back. Lay the kale out on a silpat or parchment paper–covered cookie sheet. Sprinkle with sea salt. Bake in the oven until they are flat and crisp, about 20-30 minutes. Remove with a spatula and let them cool. These can be stored in an airtight container for several days without losing their crunch. Source: Adapted from Wicked Tasty Harvest.